Sold by maxliner-usa and Fulfilled by Amazon. Gift-wrap available. 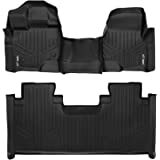 Amazon's Choice for "f150 floor mats"
Sold by maxliner-usa and ships from Amazon Fulfillment. Sold by Rydonair and ships from Amazon Fulfillment. - Far more affordable compared with other brands. 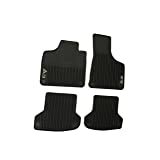 - All weather protection against Snow, Mud, Sand, Salt Water and More. - Spill Saver Lip (Prevents spills from reaching the carpet). 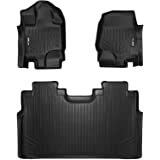 - Easy to Clean and Maintain (Detachable from Vehicle). 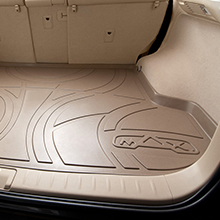 Maxliner Smartliner Floor Mats are flexible and rigid for a solid feeling and fit that will last. 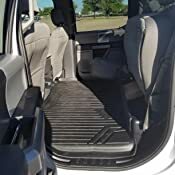 Our floor mats have a reinforced outer lip that fits snug into your car's carpet allowing for a sealed interface that blocks soil and moisture from penetrating over the side wall of the mat, so anything that gets spilled on your mat stays there, not on your hard to clean carpet, until it can be easily cleaned up. 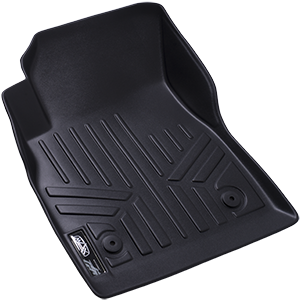 If your car's mats come equipped with a clasp, hook or fastener, Maxliner's fully customized, full coverage floor protection solution has them too. 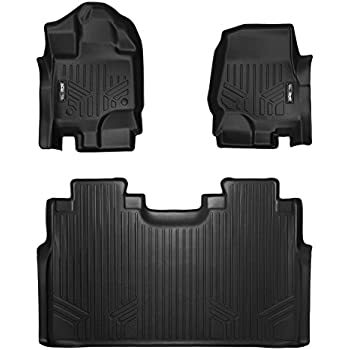 Our floor mats not only have a perfect fit and offer way more protection, they also include all of the safety holding points your car originally came equipped with. 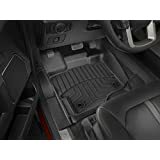 As an added bonus, Maxliner Floor Mats provide not just superior protection for your vehicle, but also enhance the overall appearance of your car's interior with their modern design and textured surfaces. I ordered these after considering two other major brands listed on Amazon. I'm sure either of them would've been fine. However, I would HIGHLY recommend this product. I have it in my 2015 F150 SuperCrew. The fit is great. On the driver's side, the studs fit perfectly that hold it in place. 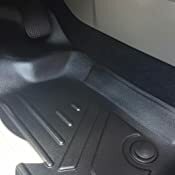 The fit around the threshold of the both driver and passenger doors was tight. I have a center console (instead of the folding middle front bench seat), and the fit around it is excellent. 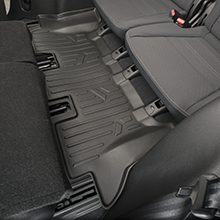 The back mat will fit all the way back to the tray under the rear seats. 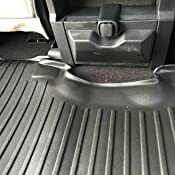 The ONLY exposed carpet in my truck is a small patch on the very sides of the front seats. I would describe the fit as "excellent." One thing to note: the rear piece will be folded during shipment. 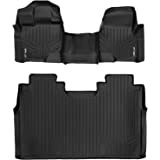 When it is unfolded to put in your truck, it may hold it's shape at the fold for a while. I live in a state where the outside heat did it's job, and softened it up and it laid down properly into place. I don't know if a heat gun or hairdryer would have the same effect, but it may help (but be careful!). Construction: These are not rubber. They are what I would describe as "semi-rigid" plastic. They aren't soft. They are flexible enough to manipulate into position while fitting, but they are stiff enough to hold their shape. They are fairly heavy duty...not very "dainty" at all. 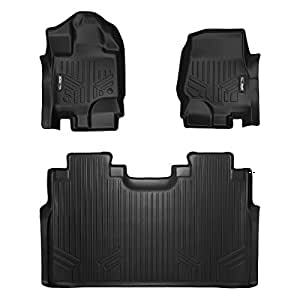 They will feel like a plastic floor under your feet (I put mine right on top of the existing carpet floor mats, although I had to remove the driver's side carpet floor mat in order to use the floor studs). 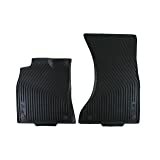 I have the black ones and they look great in a truck that had black carpet to start with. 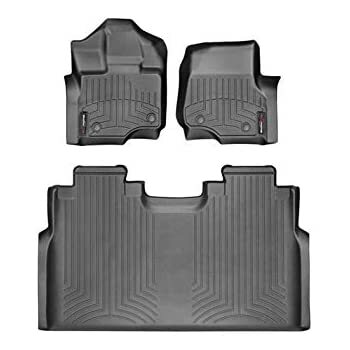 Now the "ugly:" when you put these in...you're going to see EVERYTHING that would've previously been deposited into your nice carpet floor mats! Within one week of having mine in, I was stunned by how much crap they caught! But the good news is...the value of my carpet floor will be preserved, and the inside will look great. Overall, I think these are a great value for $50 less than the better recognized names. The fit is great. Appearance is great. Durability seems to be great. If you have dogs that travel with you, I can't imagine NOT having these. 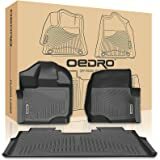 If you live in an area where you constantly have mud, snow, sand, or water on your feet, these will save your entire truck floor for just about $150. Good investment, and you'll be happy with them. 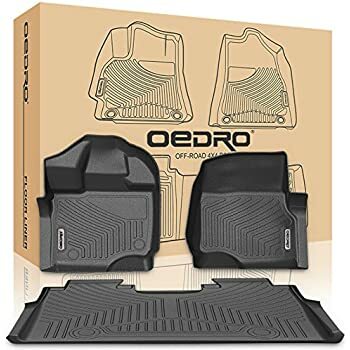 UPDATE: I've had these floormats in my truck now for one year. They have held up great, with no tears, holes, scratches/scuffs, or markings. I usually just vacuum them, which certainly does the job, but sometimes I pull them out and give them a quick scrub with soapy water and rinse them and replace them when dry. They still look relatively new. I would absolutely recommend them, and I would personally re-purchase them for whichever vehicle I ever buy. 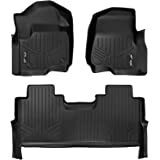 I ordered a set for my 2015 but needed to use them in a 2016 F150. The mats fit great in both trucks. If you have 2016 f150 screw with 40/20/40 seat this will not fit properly in the back. Amazon says it will fit. Box came today and the larger backseat mat is folded in half to fit into the box. Instructions are basic and really just tell you that the mats will unbend around the edges after a day or so. Or you can leave them out in the sun to help get them warmer and more pliable. I just straight put them into my truck since it was hot outside and really hot in the truck. Took these picture immediately after taking them out of the box and putting them into the truck. So 5 stars as the fit is great. Couldn't be happier. Time will tell on durability, but for the installation and look I'm very happy. They seem like quality. Goodbye Husky and Weathertech! I took a chance on these based on the reviews and boy am I glad i did. 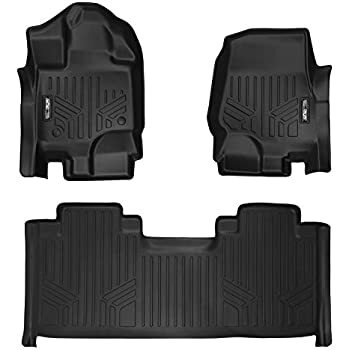 I have used both Weathertech (not impressed) and Husky (great mats) in the past but decided to try these out for my new '17 F-150 CC with front buckets. The fit is perfect including the rear mat around the center console. 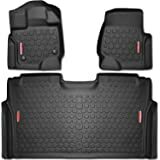 The rear mat is huge and covers everything! The material feels nice and sturdy and I am confident they will last for years to come. If you're on the fence about these I say just do it, I'm not dissappointed in any way so far. I should qualify this by saying Ive only just installed them so if anything changes I will update this review. Great fit! 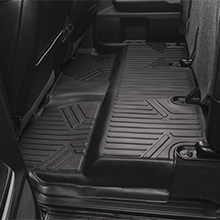 Completely covers the front foot wells and rear floor area of my 2015 F150 SuperCrew, leaving no area unexposed. There is even an overlap across the transition between the carpeting and the thresholds, which means that gunk won't accumulate in that crack. As others have mentioned, these are relatively thin plastic mats with a smooth/slick surface on the top. They are soft enough to conform, but they feel slippery underfoot, the way you'd expect a solid plastic to feel. 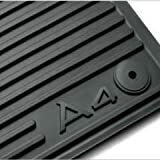 Unlike some OEM "all weather" floor mats (that are much more expensive), these are not thick heavy rubber-type material. The good part about this is that they are very easy to install or remove on a seasonal basis or for washing. 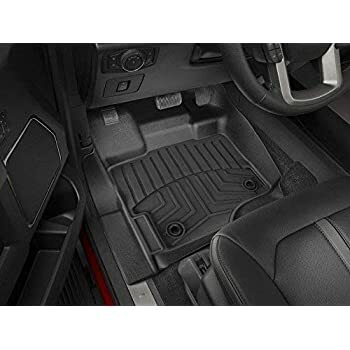 They do not have deep channels or grooves the way that the weathertech mats do, so they may not be the best choice for someone that will be dragging a lot of slush or mud into the car (there's not place for it to hide). 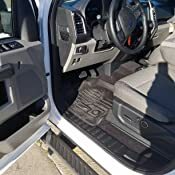 I had Weathertech mats in my last truck and wanted to try something different. These mats look and fit great. All of the carpet is well covered. The back liner lays over the entire floor (even under seats) too. Very easy to clean. The material is quite soft and pliable making install easy. 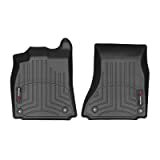 I like them better than the Weathertech and they are considerably less expensive. I spend my summer weekends on the lake boating. 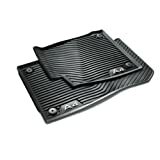 These mats are easy on bare feet and not slippery when wet. 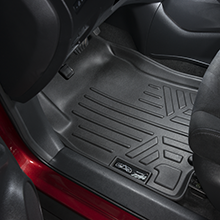 A huge contrast to my previous Weathertech mats, which hurt my feet and became slippery when wet. Great product. For the price these get the job done, but aren't as custom a fit as they declare. Buying these my intentions where that they would fit like a glove and that their wouldn't be any annoying ripples, or bumps where things didn't fit together smoothly. Not necessarily the case...not sure if this is because model years had slight changes, but the driver's side ripple is by far the most annoying since that is the most used seat, and I see if every time I sit down. 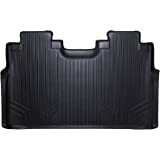 Also in comparison to other mats I've owned, the more flexible plastic seems to fit better and hug the original car seams, not the case with this rigid type plastic.